A gentleman needs hobbies. For Lord Peter Wimsey -- a Great War veteran with a touch of shell shock -- collecting rare books, sampling fine wines, and catching criminals help pass the time. In Whose Body?, a dead man wearing nothing but a pince-nez is found in the bathtub of an architect's London flat -- and Wimsey encounters a bizarre puzzle. Clouds of Witness brings Lord Wimsey to the family's shooting lodge in Yorkshire. Humans are not meant to be targets, but Wimsey's sister's fiancé has been felled by a bullet -- and his brother accused of the crime. The investigation will bring him into contact with a socialist agitator, a hot-tempered farmer, and a host of unseemly secrets. In Unnatural Death, everyone expected the ailing and elderly Miss Agatha Dawson to die -- just not quite so soon. When the doctor who treated her shares his suspicions with Wimsey, he sets out to discover who rushed the patient to her demise. 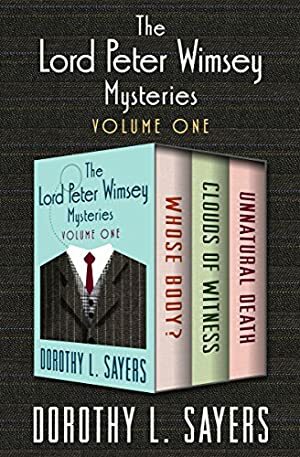 This exciting volume of renowned author Dorothy L. Sayers's beloved cozy British mystery series is a perfect introduction for new readers, as well as a familiar friend for longtime fans. Log In to track Dorothy L. Sayers on eReaderIQ. to be notified each time the price drops on any book by Dorothy L. Sayers. to stop tracking Dorothy L. Sayers. We started tracking this book on November 12, 2013. The price of this book has changed 118 times in the past 1,990 days. The current price of this book is $17.99 last checked 23 hours ago. This lowest price this book has been offered at in the past 90 days is $4.99. The lowest price to date was $0.99 last reached on May 24, 2017. This book has been $0.99 one time since we started tracking it. The highest price to date was $17.99 last reached on March 23, 2019. This book has been $17.99 2 times since we started tracking it. We last verified the price of this book about 23 hours ago. At that time, the price was $17.99. This price is subject to change. The price displayed on the Amazon.com website at the time of purchase is the price you will pay for this book. Please confirm the price before making any purchases.